I’ve recently been researching women aviators from the past century, so an exhibition currently on at the National Maritime Museum Cornwall caught my eye. Mermaids: Women at Sea is all about female mariners who challenged the preconceptions of a male-dominated world by taking to the high seas. Through first-hand accounts, film, photography and artefacts, you can gain an insight into the achievements of extraordinary individuals including Mary Lang (pictured left – what a stunning image! ), who joined a crew on the last of the merchant sailing ships to journey from South Australia to Cornwall in the 1930s, and sailing legend Dame Ellen MacArthur who became the fastest woman ever to circumnavigate the globe in 2005. “Mermaids represents a key moment for the Maritime Museum as it develops its interpretation and presentation of maritime heritage in non-traditional areas of the field by publicly addressing the hidden histories of women sailors, not because they are women but because their stories are just as fascinating and stimulating as those of men and therefore worthy of preserving and presenting to our visitors,” says Tehmina Goskar, Senior Curator at the Maritime Museum. Intriguingly, the exhibition includes an examination of the superstitions about women and the sea, from the myths of mermaids luring sailors to watery graves to the idea that a woman aboard a ship was meant to bring ill fortune to the voyage and crew. The exhibition is supported by the Hypatia Trust, a Penzance-based charity that celebrates and promotes the study and achievements of women. 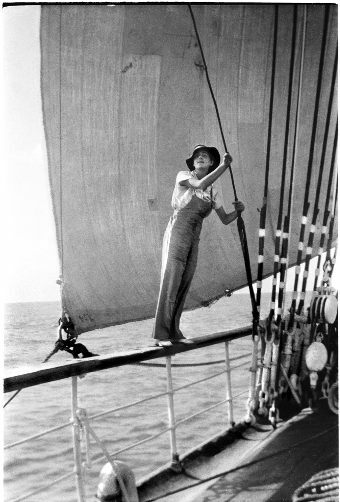 Mermaids: Women at Sea runs until 21st February 2016 at the National Maritime Museum Cornwall in Falmouth. This entry was posted in News and tagged events, exhibitions by Judy. Bookmark the permalink.